If you’re ready to level up your business but not ready for the commitment and price of traditional office space, a virtual office is your perfect solution. 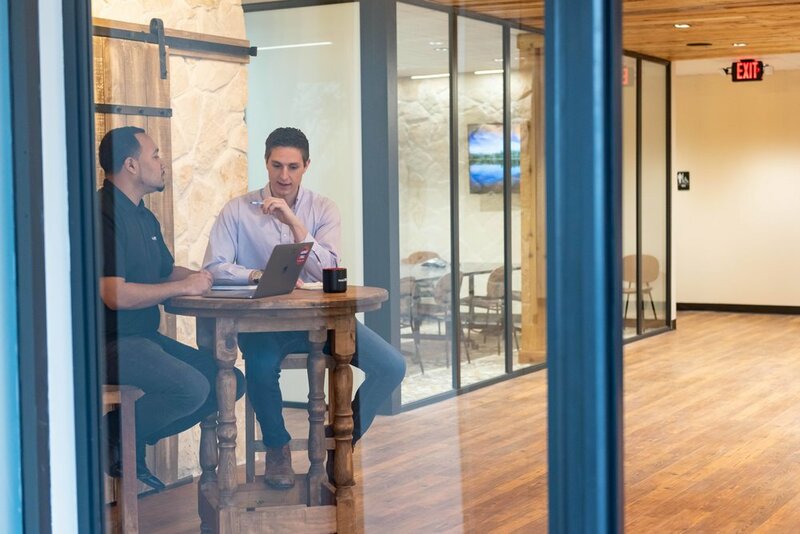 As the premier co-working and virtual office space in Houston, The Ranch is ready to help you grow your business with world-class amenities and a rustic Texan atmosphere that inspires and drives you forward. A virtual office at the Ranch gives you access to things you may have thought were out of reach for your business. Our virtual office space gives Houston entrepreneurs like you a professional business address and a flexible place to work, meet, and be motivated by like-minded business owners. There are a lot of reasons to love going into business for yourself: the independence, the creativity, the freedom to explore. And while most solopreneurs and freelancers find their work more satisfying than a traditional job, working for yourself does come with a major drawback: lack of community. At the Ranch, you get the best of both worlds. You’ll be able to focus on growing your business while still connecting with other dreamers and go-getters. Work days at The Ranch look a little different than they do at most virtual offices. Here, you’ll be surrounded by awesome Houston entrepreneurs and small business owners in our signature Texas-inspired space. Like you, they’re driven, creative and contribute to the perfect atmosphere to inspire your workflow. Take a work break on the patio and network with someone new over a cup of coffee or one of the local brews we keep on tap. At member only events like BBQ Mondays and happy hour Fridays, you’ll get a chance to hang out, network, and benefit from other Ranch members’ areas of expertise. With the member portal, you can access our online community and connect with even more Ranch Office members– even if your paths never cross during the workday. Whatever you’re looking for in a Houston virtual office, The Ranch has a membership package tailored to you and your business. Take advantage of our bullpen-style workspaces or rent a private office. With any membership, you always have general access to our shared workspaces and private phone rooms. Our conference rooms are the perfect blend of homey and professional to inspire both productivity and creativity in your meeting. With a membership, you can book one of our well-equipped meeting spaces, outfitted with televisions, whiteboards, and conference phones. When it’s time to take a break or just soak up some sunshine while you work, the Ranch has you covered there too. Unlike almost any other virtual office space in Houston, our patio and large outdoor area give you a breath of fresh air in the middle of the city. Even on days where you work from home, your membership at the Ranch is still working for you with its Houston virtual address. Professional business addresses give you credibility, but the price of traditional office space in Houston simply isn’t doable for many small business owners. A virtual office is a smart way to give your startup or small business a professional address without the price and commitment of traditional work spaces. The Ranch gives you a physical mailing address in Houston, helping you grow your business’s reputation. And our shared receptionist is always here to make sure your mail and packages get to you without any hiccups. Free parking, local beer, and a ton of coffee. We could probably stop there, but there’s more. Basing your business at our virtual office space means that you get access to deals with local Houston business and vendors through any partnerships we develop. And since we’re sure you’re going to fall in love with our space, you’ll also be able to access it for personal events. We will also setup a virtual office phone number for free, or provide a VOIP phone number for a one time fee. If you’re thinking about joining our community and gaining access to our space and all the things that come with it, we’d love to chat about what a virtual office with The Ranch could mean for you and your business. Contact us today to find out about our pricing.